For a company that prides itself on its gaming creds, Razer’s 13-inch Razer Blade Stealth has always had one weakness: no discrete graphics. That just changed Tuesday morning. Razer announced that it has updated the Stealth with Intel’s newest 8th-gen (Whiskey Lake) quad-core Core i7-8565U, along with an Nvidia GeForce MX150 GPU option. These components are stuffed into a laptop that’s only a smidge larger than its predecessor. Why this matters: Razer’s thin-and-light laptop has a lot of competition. Bringing in a new CPU and especially the discrete GPU option, along with some other design and feature tweaks, helps the Razer Blade Stealth stand out in a very tough game. We’ll see which laptops follow—and at what price points. The new Razer Blade 13 (left) is only slightly bigger than the previous model, despite the addition of a GeForce MX150 GPU. Note that the screen options include a factory color-calibrated 1080p or 4K. Both appear to be 60Hz and feature 170-degree viewing angles. For ports, Razer includes two USB Type-A ports, one USB Type-C, and one Thunderbolt 3 port. The only loss is the full-size HDMI. Razer claims 13 hours of run time on the base model. We’d guess that’s not under heavy CPU or GPU use, which would drain its 53-watt-hour battery fairly quickly. 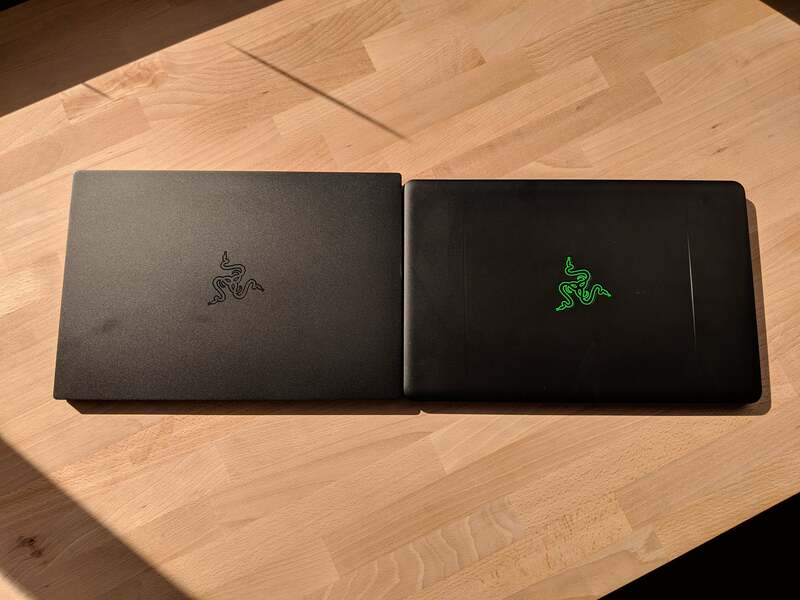 The new Razer Blade Stealth (top) sports a more modern, squared-off profile. The CPU and GPU changes inside the Razer Blade Stealth are significant. The previous Razer Blade Stealth maxed out at a quad-core Kaby Lake R Core i7-8550U with a base clock speed of 1.8GHz to 4GHz. The new quad-core Whiskey Lake U features the same 1.8GHz base clock, but the boost clock is 4.6GHz. With its 10nm CPUs long overdue, Intel has continued to goose its existing 14nm process for ever higher clock speeds. That's a significant clock boost if the laptop and CPU can hold higher frequencies. We won't know for sure until we test the machine, but they would appear to be capable of doing so. Other potential performance pickups might come from security mitigation baked into the new Whiskey Lake U chips, rather than solved in the UEFI. As for the GPU, Razer said it’s using Nvdia’s Pascal-based GeForce MX150. The MX150 isn’t new, nor is its use in a 13-inch laptop. We tested an Asus Zenbook 13 with the GeForce MX150 earlier this year. What is new is the version: Razer said it specifically choose the faster, 25-watt MX150 for more performance. 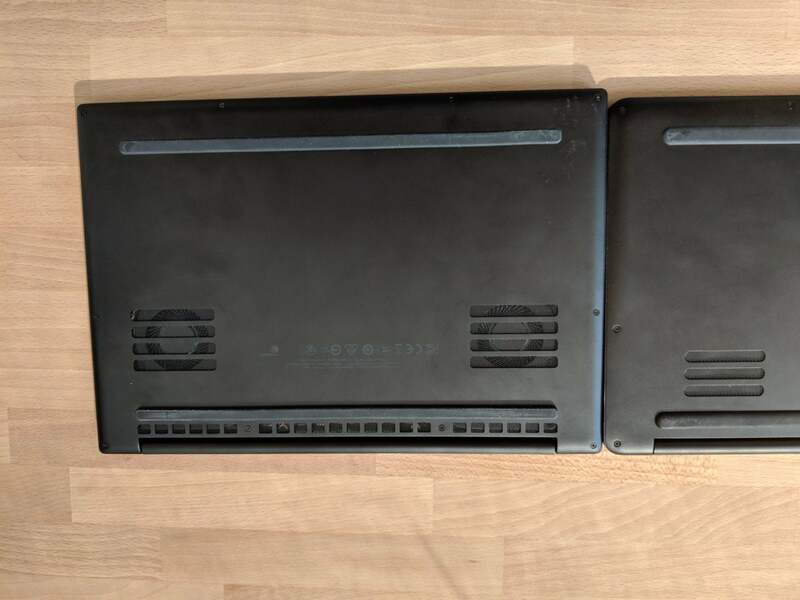 This revelation follows a petite scandal from earlier this year, when Notebookcheck.com stumbled upon laptops using a 10-watt version of the GeForce MX150 instead of earlier 25-watt versions. Both use the same name, and there’s no way for a consumer to tell the difference. In any case, much of the Razer Blade Stealth’s performance will depend on how well it’s cooled, and how hard Razer runs the CPU and GPU. The cooling ports are larger for this model to keep the additional hardware cool. The Blade Stealth boasts exterior changes as well. The new laptop is about 11 inches wide, 8.3 inches deep, and about 0.6-inch thick. It tips the scales at about just about 2.8 pounds. The shell continues to be aluminum, but gone are the distinctive—and somewhat dated—curves of the previous model. The updated Blade Stealth has a more chiseled appearance. 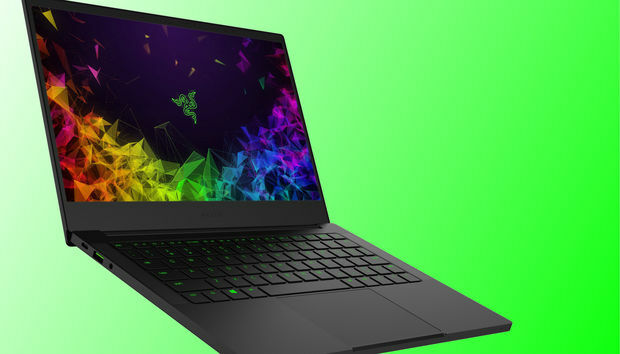 The Razer Blade Stealth has traded the glowing-green company logo for an understated black-on-black version, the better to blend into business meetings. It gets more interesting when you compare the new Razer Blade Stealth against Apple’s two mid-range laptops: the MacBook Pro 13 and the very new MacBook Air. From a performance perspective, the MacBook Air isn’t in the same class. 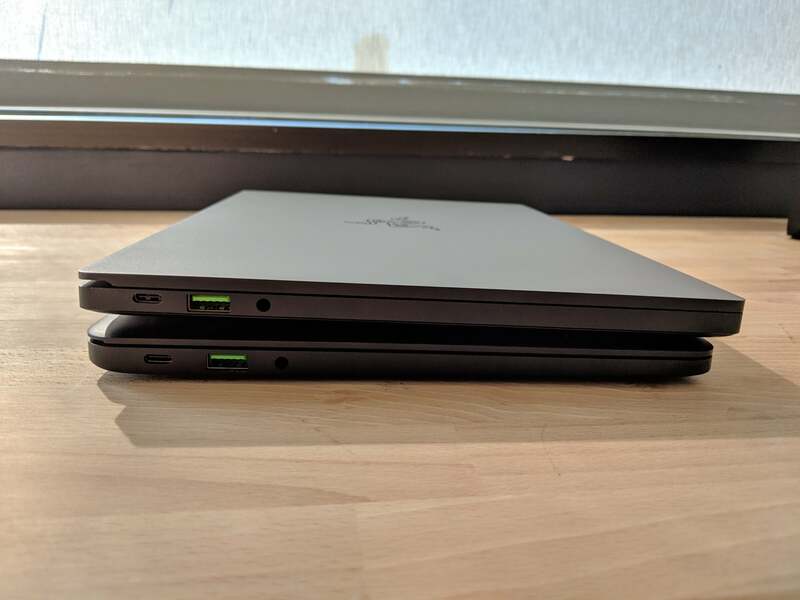 Although it’s actually about the same weight as the Razer Blade Stealth, Apple seems to be trying to match up the MacBook Air with a Chromebook, prioritizing battery longevity over performance. The Razer Blade Stealth will run circles around the MacBook Air on CPU- and GPU-intensive tasks. On the other hand, the MacBook Air, with its low-power dual-core CPU and integrated graphics, will have a different kind of last laugh because of its longer battery life. The more interesting battle is with Apple’s MacBook Pro 13. The current version features a quad-core Core i5 as its default CPU, with a Core i7 upgrade option. Apple does, however, use the 28-watt versions, which potentially run at higher clocks, while the Razer Blade Stealth has a CPU that probably runs at higher clocks by design. In the end, they may be pretty close. 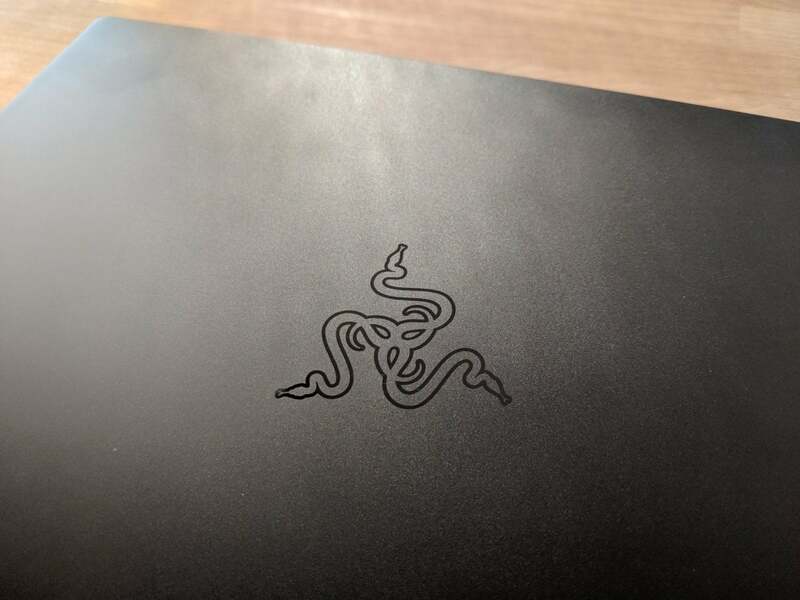 Where the Razer Blade Stealth has the edge, at least on paper, is in discrete graphics. Despite its “Pro” moniker, Apple continues to rely on Intel’s integrated graphics instead of a discrete GPU. But the MacBook Pro 13's 28-watt chip, which includes 128MB of eDRAM cache, could close the gap. While we’ll reserve judgement until we can test, we’d give the Razer Blade Stealth the edge, but perhaps not by as much as you’d expect on graphics. One area where Apple will eat Razer's lunch is in storage. Apple’s custom (and permanent proprietary) SSDs have proven to be invincibly fast.